We are all familar with Pythagoras who discovered that, for a triangle, the square of the hypotenuse is the sum of the squares of tte opposite sides. What we may not realise is that hey was also, arguably, the founder of mathematics and created a highly influential religious sect which worshipped numbers. What did he mean? Pythagoras had founded a mystical sect which worshipped numbers and believed that numbers held the secrets of the cosmos and nature. The Pythagorean Sect was vegetarian so it seems unlikely that he was saying that beans should not be eaten. There are various theories as to why he should have urged his followers to stay away from Fabacae in general and Broad Beans in particular. Some suggest physiological reasons (there is a genetic disease which causes bleeding in some people who eat Broad Beans), others prefer to believe the proscription to be for symbolic or spiritual reasons – ancient Greeks believed the reincarnated souls of people were to be found in beans. But perhaps Pythagoras was referring to the role of Beans in Politics. 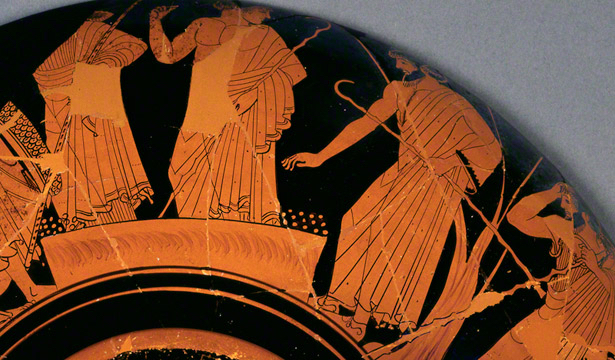 The ancient Greeks had voted using beans (psephos – the root of the modern term for election analysis, psephology) by placing them into a pot to signify their support for one person or another. It was not secret and therefore open to abuse. To such avoid corrupt practices and the continuation of oligarchies, ancient Athens developed a system (possibly the first type of Democracy) called Demarchy, which used bean machines to choose politicians. 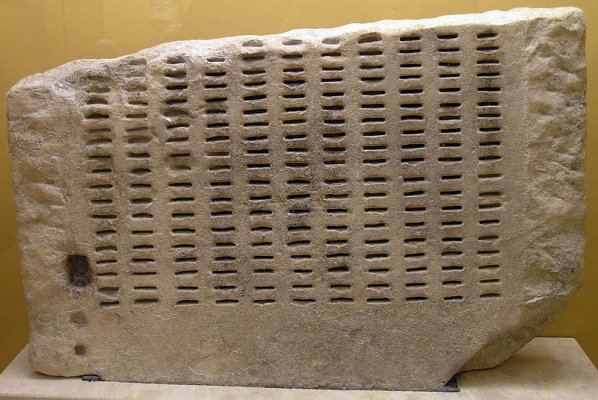 The machine (the kleroterion) would be filled up with black beans, except for a number of white beans corresponding to the number of people being chosen for office. If your name (inscribed on bronze name tags called pinakion) popped out of the machine when it served up a black bean, you were rejected. So if 20 people wanted one job, the machine would be filled with 19 black and one white bean.I’m simplifying what was actually quite a complicated process – which you can read about here. Whether Pythagoras rejected this approach because he regarded it as a vulgar use of what he believed to be divine mathematics or not is debatable. But to this day, the phrase “bean counters” is considered rather derogatory – signifying a narrow approach to numbers, with an excessive interest in controlling expenditure or budgets. Pythagoras believed that mathematics helped people understand the beauty and divinity of nature. He rejected the “bean counting” approach. There are clear parallels with Natural Capital Accounting. Natural Capital accounting adopts a linear, reductionist approach to valuing nature. The different aspects of nature (which are also characterised as ecosystem services) are dealt with separately, broken apart so their inter-relationships are ignored. Aspects such as spiritual value or nature as a source of inspiration, are ignored because they are not amenable to being monetised – given a monetary value. I suspect most people would be revulsed at the thought of placing a monetary value on a spitirual belief in the value of anything, including nature. In this respect I am with Pythagoras, though I love Broad Beans! Thanks to Professor Sian Sullivan at Bath Spa University, for planting the seed of an idea for this post. This entry was posted in Natural Capital and tagged bean counters, Natural Capital, pythagoras. Bookmark the permalink.